Will Stalin Double-Cross and Invade Britain and America? HERE'S a prophetic BOMBSHELL!... The plain truth about Russia - the astounding prophecy of Ezekiel 38 and 39! Perhaps no prophecy has received more wide-spread interest and attention than that of Ezekiel 38 and 39. As usual there are various interpretations. Those most popularly believed and expressed are: 1) That the prophecy pictures "Armageddon" - with Russia the aggressor in this final "Armageddon" battle. 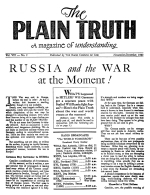 2) That Russia will conquer Germany, become the "Beast" of Revelation with Germany merely one of her satellites, and thus become the leader at "Armageddon;" or 3) That Russia, either alone, or by conquering or allying with Germany, will double-cross her Anglo-American allies and, during this war, invade Britain and America.